Muse provides a series of very compact, agile and powerful BLDC motor drives for many professional robotics applications. The muse BLDC drives are plug & play devices, they connect via an Ethernet bus to any Ethernet enabled device. All their features can be controlled through the muse C++ API and the muse ROS packadge so advanced applications become easy and accessible to even high-level software designers. A unique IP address can be assigned to every device so multiple devices can be controlled simultaneously with real-time feedback. A user-friendly high level UI is provided for the identification of most BLDC motors and the optimal configuration of the device including PID tuning. It only takes a few minutes to setup and move the BLDC motor of your choise. Cutting-edge Field Oriented Control (FOC) for ultra smooth torque output, great low speed performance and high efficiency, excellent for direct drive solutions. Sensorless or Sensored commutation with multiple input options: Muse on-axis or off-axis magnetic encoders (retrofittable), Quadrature encoders and Hall sensors. Control modes: Current, Speed, Position. 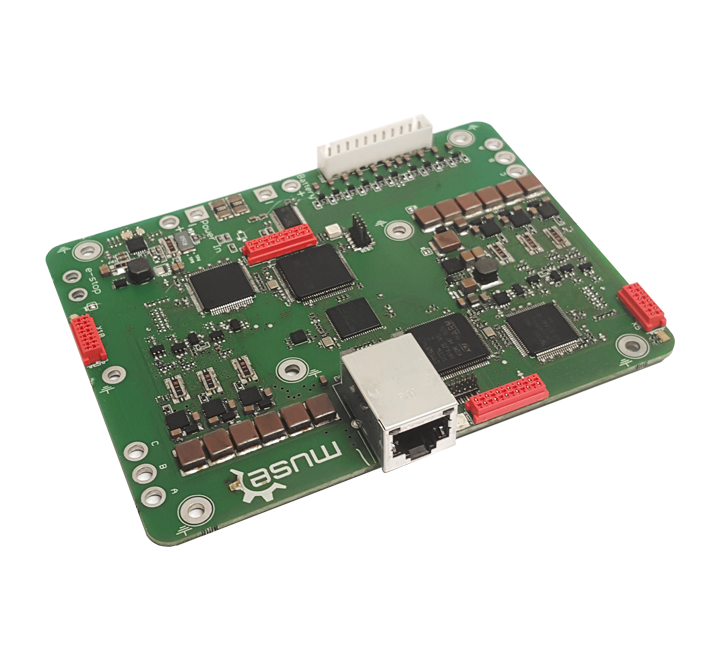 Muse provides an all-in-one solution for differential drive mobile robots with advanced features. A single board controls two BLDC motors with all the features of the Muse BLDC drive, includes a power management system able to charge up to 6-cell (LiPo, LiFePO4) and several inputs for sonar and IR sensors. DUAL, cutting-edge motor drivers with Field Oriented Control (FOC) for ultra smooth torque output, great low speed performance and high efficiency, also excellent for direct drive solutions. 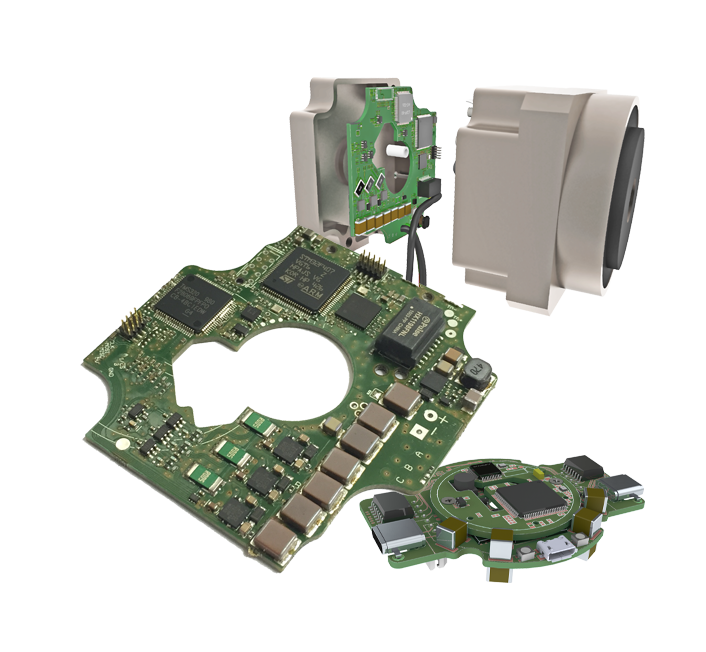 We can provide customized designs, tailored to our clients needs for high-end brushless motor drivers tightly integrated within their mechanical structure. This is the best option when off-the-shelf solutions are not an option. Our modular architecture and extensive expertise allows for quick turnaround times. Liscensing options available. Miniaturization based on customer needs. Dimensions Typically 60x60mm, can be miniaturized to less than 30mm, depending on power output. Standard encoders, on-axis and off-axis, which can be used with our motor drivers to allow maximum performance. IMU Custom solutions fitted to your needs can also be discussed. On-axis encoders, 14-bit absolute (magnetic), up to 28K rpm. Off-axis encoders, 16-bit ABI / 18bit SPI, incremental, 300rpm max. GPS: High or normal precistion (uBlox). We provide with up to 15cell Lithium battery chargers | monitor | balancing | protection. 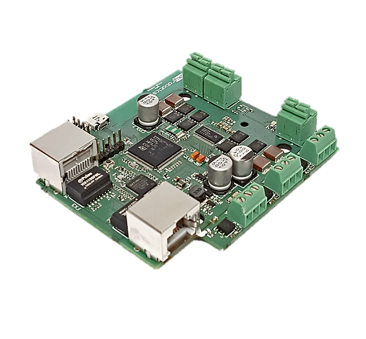 Muse provides a series of stepper motor controllers for many professional robotics applications. 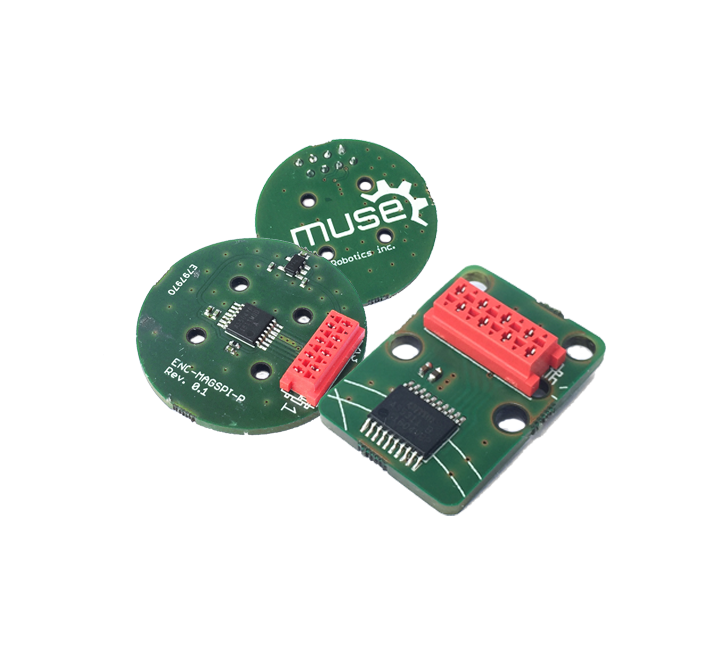 The muse stepper controllers are plug & play devices seamlessly connected with any other muse device, e.g. 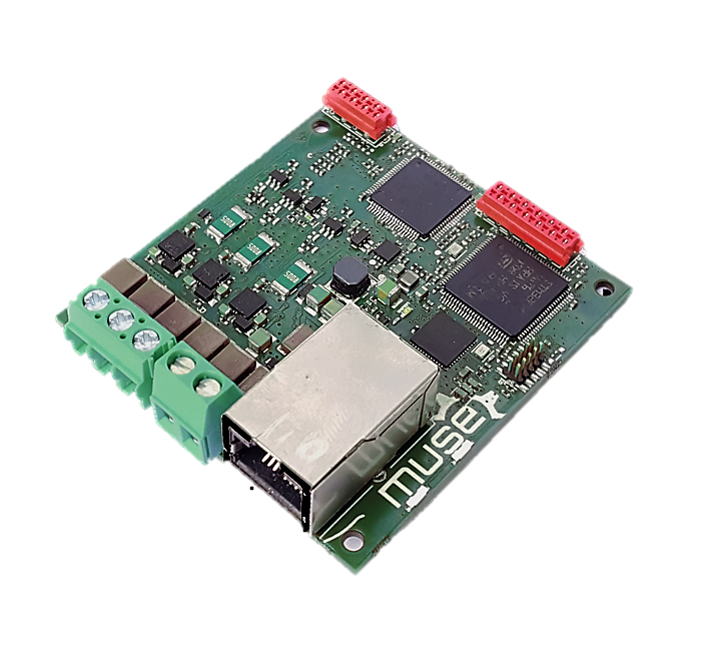 muse BLDC drives, and they connect via an Ethernet bus. All their features can be controlled through the muse C++ API and the muse ROS packadge so even complex setups become easy and accessible to even high-level software designers. A unique IP address can be assigned to every device so multiple devices can be controlled simultaneously with real-time feedback. Three inputs for limit switches are available and an on board Ethernet switch allows for daisy-chained configurations for easy cabling. A user-friendly high level UI is provided for the configuration of the device. It only takes a few minutes to setup and move the stepper motor of your choise. Advanced stepper control with up to 256 microstepping. Three inputs for limit switches. Embedded magnetic encoder for real-time position feedback. Control modes: Speed, Position and Motion (profiled acceleration-deceleration). Fault protection, Stall detection, Slip detection, Over and Under Voltage protection. We believe that Ethernet is the best option for most applications which use ROS. However, we can offer other communication protocols like CANopen, Serial. 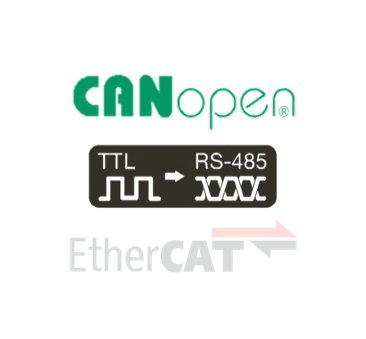 We are also working on an EtherCAT option. All muse devices can be controlled through the muse universal C++ API. It is a user-friendly API that enables fast and easy control of all the features and parameters of any muse device. From high-level commands to very low-level device configuration, users diverse expertise experience flexibility with ease. The muse API has a class representation for every type of muse device (Motor driver, sensor module, battery management module). A Module Discovery service automatically detects modules connected on the Ethernet network. Using the Module Discovery service, one can simply select the desired module either via its IP address or its Name, initiate the connection and start sending commands. Multiple devices can be connected to the same network and can be controlled simultaneously. To further enhance integration capabilities, muse is ROS enabled. A dedicated muse ROS package wraps around the C++ API offering all the advantages of a well established open source software platform for robotics to the users of muse hardware. The muse C++ API takes advantage of a threaded architecture so each module has its own thread for communication and control. On top of the C++ API and ROS package, an intuitive user interface is included that allows the user to configure any muse device in just a few clicks. Now it's easier than ever for anyone to start developing a professional robotics application. Simply connect the hardware, configure its parameters using the provided UI, and start working on your application through the C++ API or ROS package even from day 1.